Brighton were made to pay for a slow start in their 3-2 defeat at Crystal Palace this afternoon. Here's six things we learned from the game. Brighton's failure to deal with set-pieces came back to haunt them at their arch rivals in the opening 14 minutes. The Seagulls conceded a host of goals from corners and free kicks earlier in the season but had appeared to correct that in recent times. Palace went into the game having scored 45.5 percent of their goals this season from set-pieces and went ahead with a move straight off the training ground. Brighton expected Luka Milivojevic to whip in a corner but he played it short to Ruben Loftus-Cheek who passed the ball back to Palace's captain. His low cross-shot was too hot to handle for Seagulls keeper Mathew Ryan and Wilfried Zaha was on hand to poke the ball home from a yard out. The Eagles' second goal was equally as disappointing from a Brighton point of view. From another corner, efforts by James Tomkins and James McArthur were blocked before Tomkins' shot squeezed home past Ryan. Wilfried Zaha said pre-match that he wanted to beat Brighton so 'they can just go back to wherever they came from' and he backed up his words with a sizzling performance. Zaha was again played up front by Palace boss Roy Hodgson, despite Christian Benteke coming back into the matchday squad. 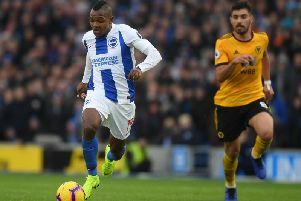 There is no love lost between the Ivory Coast international and Brighton fans, with Zaha saying in November he hates Brighton 11 out of ten. He knocked home the opener from a yard inside five minutes and later in the first half was left unmarked to head home Luka Milivojevic's clever ball over the Albion defence. After a nightmare opening 24 minutes, Albion had their chances to get something out of the match. Jose Izquierdo cut the deficit to 3-2 on 34 minutes and the Seagulls tightened things up in the second half but still created openings at the other end. Glenn Murray volleyed a Beram Kayal cross inches past the far post, before he saw another effort blocked by Mamadou Sakho. Another excellent opportunity came and went when Albion quickly counter-attacked and were two-on-one for a moment but Anthony Knockaert over-hit his pass to Jose Izquierdo and the chance went begging. Late on, Brighton were twice denied by Palace keeper Wayne Hennessey. He just got to the ball before Leonardo Ulloa to punch clear Knockaert's cross and then produced an outstanding save low down to keep out Dale Stephens' dipping effort. Arguably the best opportunity came in injury-time when Ulloa flicked on Beram Kayal's cross to Murray, who looked to flick the ball home from close range but only guided it back across goal. Albion also had chances to get more out of their previous two matches against Leicester and Huddersfield. You just hope the missed opportunities aren't going to prove costly come the end of the season. It was a fiercly-fought derby clash as expected and referee Andre Marriner handled the match well to ensure both sides finished the game with 11 men. Albion midfielder Dale Stephens was booked for a foul on Wilfried Zaha early on and Palace captain Luka Milivojevic was yellow-carded for throwing the ball away. Both could have seen red for second bookings later in the first half on another day. Milivojevic avoided a second caution when he tripped Beram Kayal and Stephens then twice got away with a second booking for fouls. Another incident Marriner had to rule on was when Jose Izquierdo's shot was blocked by Joel Ward. It did strike the Palace defender on the arm but from point-blank range and the referee quickly waved away Brighton appeals. Glass half full or half-empty? A run of one point from four games has some Albion fans nervously looking over their shoulder but thankfully for the Seagulls neither Southampton or Stoke have made up any ground in the last few weeks. Brighton have a difficult finish to the season with five games against sides in the top seven and would like to spring a surprise result somewhere to make their finish a little less nervy. However, they still might have enough points to stay up without collecting another draw or win. Southampton will need a minimum of seven points from their last five matches - which includes a visit from Manchester City on the last day of the season, plus trips to Leicester and Everton - and Stoke will have to get a minimum of eight points from their last five games to have any chance of finishing ahead of Albion. The match was the 99th between the sides and there have surely been few so important - and as entertaining. After a 0-0 league draw at the Amex in November, Brighton knocked the Eagles out of the FA Cup 2-1 in the FA Cup third round. This was arguably the most important clash of the season bearing in mind both sides position in the Premier League table and Palace moved to within one point of the Seagulls, although have played a game more. It was Albion's first-ever top-flight defeat to Palace, so there were few positives to take for Brighton supporters but at least they saw the Seagulls score twice on the road. Albion went into the game as the lowest away scorers in the Premier League - but have now overtaken bottom club West Brom.